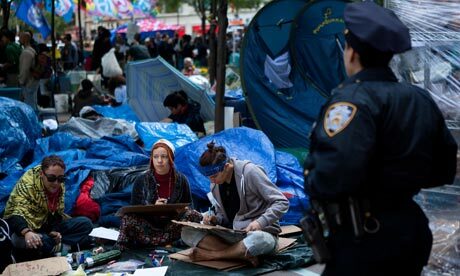 Following their eviction from Zuccotti Park early Tuesday morning, Occupy Wall Street protesters were already pushing to return to their newly cleaned campgrounds. Lawyers lined up to file a temporary restraining order, and a judge granted protesters the right to return to the park between the time of eviction and the time of Tuesday afternoon's full hearing. The judge who granted the order, Justice Lucy Billings, has a number of liberal credentials: she is a 1973 Berkeley Law School graduate and spent a quarter century working for the ACLU. While Billings may be an ideal enabler of the movement, the OWS lawyers have even more radical backgrounds. Check out National Review's Patrick Brennan's analysis of the lawyers after the break, and let us know your thoughts in the comments. Many of the OWS lawyers are affiliated with the National Lawyers Guild, a group of progressive-minded lawyers focused on human rights over property rights. The OWS legal team is composed of Michael Ratner and Margaret Ratner Kunstler (formerly married), Alan Levine, Michael J. Boyle, Daniel Alterman, and Yett Kurland. According to Brennan, Ratner and Kunstler are the authors of "Hell No: Your Right to Dissent in the Twenty-First Century," and have a significant history of "anti-Israel advocacy, including the charge of Israeli 'apartheid.' Ratner has accused Israel of 'massive violations of Palestinian rights' and 'inhuman [sic] treatment of Palestinians.'" Levine "has also publicly expressed anti-Israeli arguments," especially unsettling in the light of anti-Semitic sentiments present at OWS. Besides defending a number of Black Panthers and members of the Black Liberation Army, Boyle has "represented no fewer than four men with connections to terrorism, basing his arguments on legal technicalities. Most appallingly, he represented Pakistani terrorist Shahawar Matin Siraj in an appeal of his conviction for plotting to bomb Manhattan’s Herald Square subway station. There was no dispute over Siraj’s guilt; Boyle appealed the decision on the grounds that Siraj had a right to access police records of his own oral statements — an argument that was legally unjustified and rejected." Alterman calls his involvement with the 1971 Attica prison rioters "among his proudest achievements." It should be noted that at Attica, "there was a brutal riot that involved prisoners' taking ten guards hostage, and the New York State Police became overly violent in response, but Alterman sees...his work [as] 'a story about justice' and 'the legitimate complaints of the inmates.'" Finally, Kurland might not have quite as radical a past, but her work is ironic in the context of the protests. She worked "to ban tour buses from her neighborhood in the West Village, arguing that their 'noise pollution' was greatly compromising the residents' quality of life, and promising an investigation into 'all the environmental hazards that these tour buses may pose.' Perhaps she has not considered OWS protestors causing the same damage to a private park and the local environment. Given their radical backgrounds, this is yet more proof the Occupy Wall Street groups don't represent 99 percent of Americans.